Clive Thompson LRPS Photography: Browns Hotel (formerly the Queens Head Hotel as here in 1974) West Street, Tavistock PL19 8AQ around 1974. 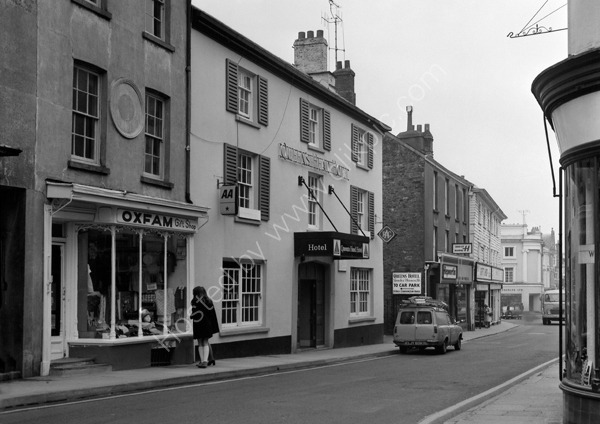 Browns Hotel (formerly the Queens Head Hotel as here in 1974) West Street, Tavistock PL19 8AQ around 1974. The Queens Head Hotel public house in West Street, Tavistock around 1974 and before its conversion to the Browns Hotel. An Oxfam retail unit has been set up to the left, a van (LJY 601H) is parked outside and a lorry is coming up the road towards us. Hepworths is advertising Hand Cut Tailoring. For commercial use of this photograph please visit www.alamy.com and search for ADOX37 but for a one off print, please see below.